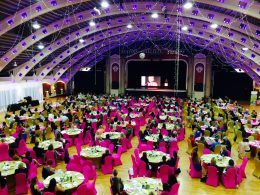 When I arrived at the historic Coliseum for the St. Petersburg Chamber of Commerce’s 2015 Iconic Women event, I expected to be challenged by Kate White, Cosmopolitan magazine’s former Editor-in-Chief. I also expected to be inspired by this year’s celebrated female leaders. What I didn’t prepare for were the many other happy women I would encounter who were present, but didn’t stand on stage. Kate White’s keynote empowered several hundred attendees with her Three Strategies for Creating and Keeping Success. Calling upon her own experience, Kate encouraged women to “go big or go home,” to think less about working “hard” and more about working creatively by launching bold and innovative new ideas in business. The publishing icon distinguishing herself anew as a suspense novelist also advised women to become mindful architects of both their personal life and career. “At the end, we want to go big — but we want to go home, too,” she urged. During the past twenty years, the St. Petersburg Chamber of Commerce has celebrated heavy hitters like Mindy Grossman, the CEO of HSN. Chris Steinocher, President of the St. Petersburg Chamber, shared the program’s 20 year history with me and reflected upon a more recent rebranding and expansionist approach. The Iconic Women title proved an apt new moniker for women of merit. Not every iconic woman needs to stand on stage or receive an official award. Meet a few women I encountered at the event whose talents, vision and enthusiasm inspired me and whose happiness was patently in evidence. Imagine turning your love of coloring into a midlife cottage industry? Leeann Kroetsch was artistically inclined and loved to color as a child. She fondly recalls winning several coloring awards in school and the day she shocked her mother by practicing the same talent on her family’s living room wall. Leeann found a rewarding career where she could exercise some of her interests, but two years ago she launched something new. Her husband picked up on the avid interest in potential clients and encouraged her to start a side business. 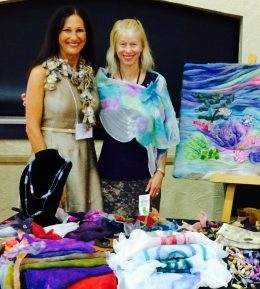 Employing an eye for color and a unique process of combining fine silks with felt and wearable art, Leeann is the satisfied designer/creator of Threaded Art Wear. “Now I get to use both the left and right sides of my brain!” she laughed. Consider the implications of finding a way to turn disabilities into creativity, community and profitability. 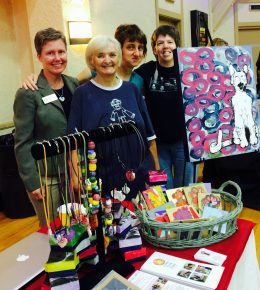 Now in its 20th year, the St. Petersburg based Creative Clay provides arts accessibility for people with disabilities and in health care settings. The studio boasts an array of confident, happy artists who hone their crafts, learn a business and earn a commission through the sale of their artwork. “Every day, I get to come to work surrounded by people who love their art and love their job,” executive director Kim Dohrman told me. Her happiness stems not just from the staff and the teachers that work there, but from the artists themselves love their work. In the midst of a faltering economy and a frustrating position in the real estate industry, Sandi Roper went to bed with a prayer. She asked God to give her a sign. She’d never made candles before but decided to purchase a 50 lb. bag of wax and some natural fragrances. In three years, she’s never made a bad batch. 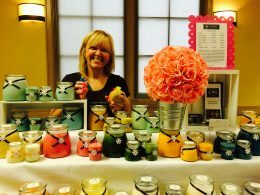 Her Citrus Blossom Brand Soy Candles now includes saches and custom brands for specialty clients. It’s been an inspired idea that warms Sandy’s spirit and soul while catering to a growing market of devotees. “I’ve never been so happy in my life,” she told me. According to St. Petersburg’s Chamber President Chris Steinocher, women prove themselves iconic in multiple and diverse ways. 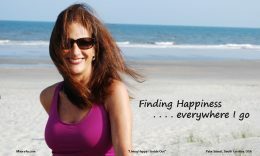 Here’s hoping you’ll find your own happy space — and become an iconic woman yourself!